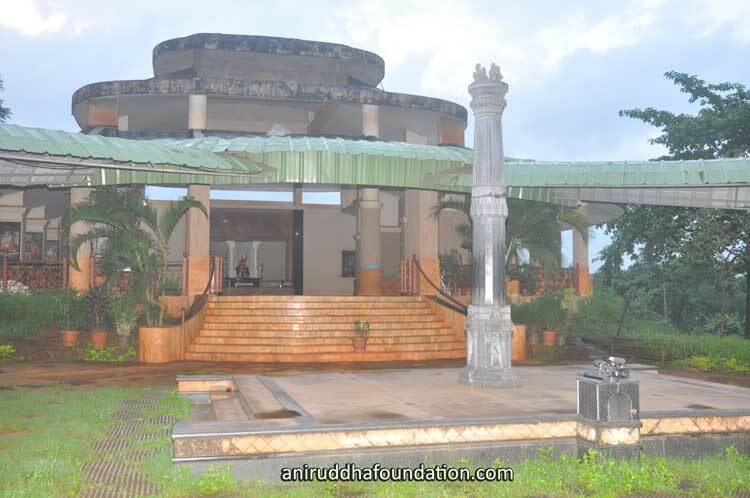 Govidyapeetham is the brainchild of Sadguru Aniruddha Bapu. The ‘Chaitra Utsav’ of inauguration of Govidyapeetham was celebrated from April 13 to April 15, 2002 with great fervour in an extremely sacred ambience. 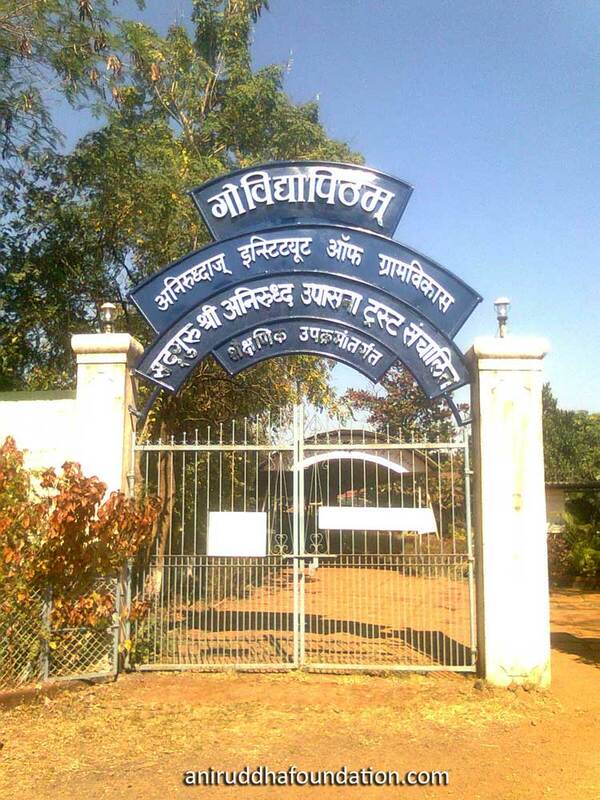 ‘Govidyapeetham’ has been constructed over 16 acres of land in Kothimbe, Karjat. It is at about a distance of 16 kms from the railway station. In Indian culture the cow is considered divine as she is the embodiment of ‘satvik’ or pure virtues. She is raised to the status of Goddess. Modern science as well as medical science have recognised the importance of the cow – her milk, her urine, her excreta – in our daily life. Here, research based on the process of reproduction of the Gir cows undertaken by Balram (Shree Krishna’s brother) is being carried out. Objective is to study the various facts of Shree Krishna’s Gopalvidya with the help of modern technology and create synergy for development of humanity. Govind is Shree Krishna himself. Studying Shreekrishna’s life, His personality, His capabilities, His mission, His principles constitute Govindvidhya. Govidhyapeetham aims to revive some of the arts and skills considered obsolete with the passage of time. These are the Govidhya, the Gomatividhya and the Gayatrividhya. Likewise to revive the spiritually beneficial chants or ‘ mantras ‘ viz. the Gosookta, the Gomatimantra, the Surabhimantra and the Gayatrimantra. 4) To impart training in physical education, exercise and in the art of ancient warfare. To conserve nature and the village Ecology . 1. Govidhya Study Centre or Shree Krishna Temple. As you enter the temple, one is immediately attracted towards the idol of Shree Govind Girdhari (Shree Krishna) holding the mountain Govardhan on the little finger of His left hand, assuring us of our safety. The pillars of the temple remind us of the cow-herds, the Gop and the Gopis making an appeal to Shree Krishna to protect them. As you go around the Temple for a ‘ pradakshina’ (circumambulation) from the left you get a glimpse of the photo frames of the ten Gurus, which are: Shree Atrinandan Dattatreya, Mahapran Vajrang Hanumant, Bhagwan Shree Rishab Devji, Shree Guru Gobindsinhji Maharaj, Sant Ramdas Swami, Shree Valmiki Rishi, Shree Ved Vyas, Shree Yagnyavalka Rishi, Shree Vashishtha Rishi, Shree Vidhya Makarand Gopinath Shastri Padhye. As you are half way in your pradakshina, on the left hand side of the idol of Shree Krishna, you get the ‘darshan’ of the picture frames of ten prominent saints – Tukaram, Mirabai, Narsi Mehta, Purandardas, Surdas, Devi Andal, Eknath Maharaj, Gaurang Chaitanya Prabhu, Sant Tyagraj and Sant Tulsidas. Facing the Shree Krishna idol, a pond of water known as Pushkarni Tirthkund has been built. The trees Muchkund and Kadamb are on the borders of this pond. The water from the ritual bath to Shree Krishna Govind Girdhari is emptied in the pond. In between the Pushkarni Tirthkund and the Govidhya Study Centre, lies a squarish platform with a column on which the divine bird, Garud (Eagle) has been installed. The Garud stands with folded hands facing the Muchkund tree and Shree Krishna’s idol. Garud and Hanumanta on the column symbolise devotion. Five Dhyan Kutirs for meditation are built here. Meditating here helps the devotee to purify his mind and eventually get rid of his stresses and strains and be disease free. Before Govidhyapeetham’s inauguration, 33 Japaks were chosen to chant the sacred name continuously (from 3rd April 2002 to 12th April 2002) after which the five Dhyan Kutirs were considered purified for other devotees to meditate. On the 8th April 2002, Sadguru Aniruddha Bapu established the idol of Govardhandhari Shree Krishna in the temple. Thereafter, foundation of the Dhuni Mata was laid. With Bapu’s direction, Suchitdada kindled fire in the Dhuni. The Dhuni has been kept lit at all times. The sacred ash or Udi from this fire is available for all at the Kund at Gurukshetram at Khar. As you enter Govidhyapeetham, on the left side amidst the coconut-groove a Tulsi-Vrindavan has been installed. This Tulsi-Vrindavan is a fountainhead of purity, auspiciousness, devotion and strength. The jap ‘Om Adiguru Gopalak Dattatreya Paahi Mam’ may be chanted underneath this tree. 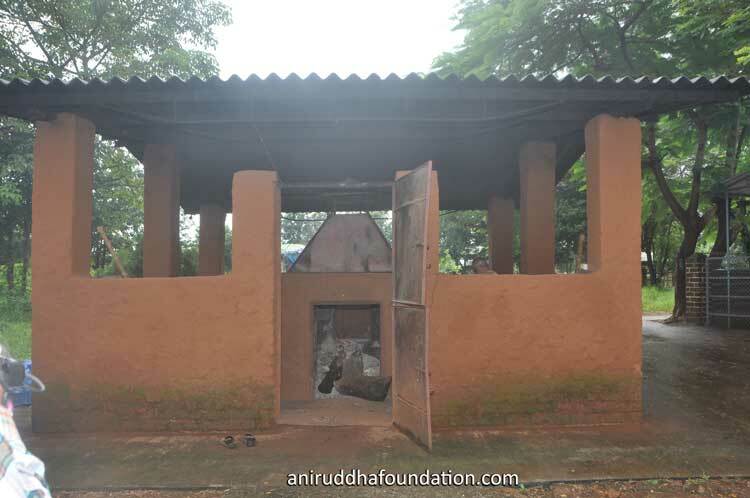 In the morning, the cows from the Goshala are left free here to graze grass. Shree Sainath stayed in Dwarkamai at Shirdi. A replica of the Dwarkamai has been established by Bapu at Govidyapeetham. A statue of Sainath giving Udi has also been installed here. Udi has been used in building the walls of this Dwarkamai. Whoever sits in this place, intently looks at the Murti, meditates and contemplates, his devotion would gather strength – is the promise of Bapu. 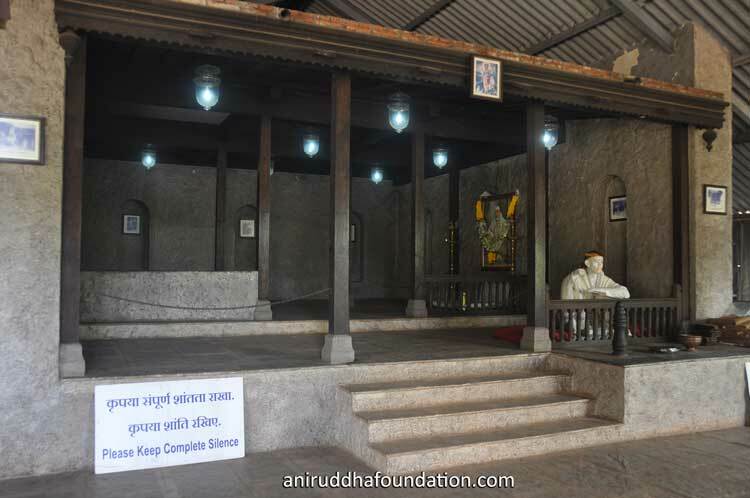 has been established by Bapu at Govidhyapeetham. This project is run at an Govidhyapeetham. On Saturday and Sunday, shraddhavans come here in huge numbers to offer their services and take great pleasure in participating in Bhakti(devotion) – Seva(devotional services).